A Junk-Foodaholic's Journey to a Healthy Lifestyle: American Idol Results: Will it be Conway or California? American Idol Results: Will it be Conway or California? Did you watch American Idol's finale last night? Did you spend four hours of your life voting for your favorite idol? I did... on both counts. I know, it's insane! I've never voted for a contestant as many times as I have for Kris. Listening to a busy signal for hours on end is infuriating! But as crazy as it sounds - I did it anyway. I did it for Kris. All in all, the show was disappointing. The only highlight of the evening, for me, was Kris' performance of "Ain't No Sunshine". If interested, you can watch it here. I didn't care for Adam's "Mad World" - too much drama for my tastes. Simon gave round one to Kris, which I had to agree. And I didn't really like the fact that Simon Fuller hand-picked the songs for Adam and Kris to sing, though I thought they both performed well. Adam sang Sam Cooke's "A Change Is Gonna Come" and Kris sang Marvin Gaye's "What's Going On?". Simon gave round two to Adam, which I predicted because I knew Simon wasn't going to prefer Kris on two out of three performances - he has championed Adam throughout the season and pretty much 'dissed' Kris from week to week. But to end the show with the two contestants being forced to sing Idol Judge Kara DioGuardi's song, "No Boundaries," was downright painful to watch... twice! Every year, I dread the "Coronation" song and every year, American Idol never fails to deliver... a bomb, that is. Saying the song was awful is being too kind. If you like pain, you can listen to Adam and Kris sing the song. I thought Adam was going to hyperventilate and Kris bungled the lyrics (though I can't blame him - the lyrics are embarrassing). Ugh! What's worse, is that the winner has to release "No Boundaries" as their first single! But the greatest disappointment was hearing Simon say he wasn't going to criticize the song. Simon is usually the only judge who is brave enough to actually say what every one else is thinking. In a few short hours we will know who is this year's American Idol. I'll be happy regardless of the outcome. 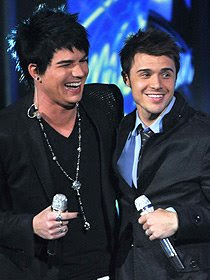 Both Kris and Adam are talented artists and will undoubtedly have terrific careers. For a special treat tonight, tune in to hear last year's Idol winner, David Cook, perform his song, "Permanent." P.S. I watched a great video this week of Jamie Foxx being interviewed on Ellen DeGeneres' show. In the interview, Ellen asks Jamie what he thought about Adam and Kris. Listen to what he says about Kris. It's pretty funny. Enjoy! American Idol Finale Tonight: Will Cheese Dip Be The Difference? Kris Allen Day Was 'Kick Awesome'! Labels: American Idol Results: Will it be Conway or California? Congrats your guy won, I agree he's talented, but what a shocker for me because Adam will be the super star. It didn't surprise me though because America wanted the boy next door the underdog even Kris knew Adam should have won. About 3 weeks ago, I suddenly realized that while I was truly entertained watching Adam... if I had to say who I would rather hear played way to often on the car radio it would have to be Kris. I'm so happy he won! Jude - Thanks! I am glad Kris won though you are right... Adam is a superstar. Vettech - I agree wholeheartedly. Kris' music is more my style. I absolutely LOVE his voice. It's so smooth and nice. I downloaded 'Heartless' from iTunes and listen to it a lot. I still prefer his acoustic live version though.